WHAT IS THE GOP BACKED DREAM ACT? Sen. Marco Rubio (R-FL) has made it clear he wants to push for a GOP-backed DREAM Act that would give undocumented students legal status — but not citizenship — and now Republicans hope to use this watered-down version of the bill to win support from Latino voters. Sens. Jon Kyl (R-AZ) and Kay Bailey Hutchison (R-TX) are also working on a bill like this, which is being kept under wraps and is expected to be unveiled if or when Mitt Romney wins the GOP presidential nomination. Rubio told The Hill that he has nothing to announce about a non-citizenship DREAM Act, but said, “We’re working toward that and hopefully very soon.” While Rubio, Kyl, and Hutchinson are supposedly prepping a Republican plan, it’s worth noting that the original DREAM Act — to provide citizenship to undocumented students if they meet certain requirements — was a bipartisan plan that had support from GOP Sens. Orrin Hatch (UT) and John McCain (AZ). [G]roups that advocate for immigrants are skeptical of reforms that fail to grant a path to citizenship. “Any proposal that is put on the table as to the fate of these children, who are in all consideration American, should be measured by what place they’re going to have in our society,” said Clarissa Martinez, director of immigration at the National Council of La Raza. Martinez said creating “a class of nation-less people” would not be good for the country. 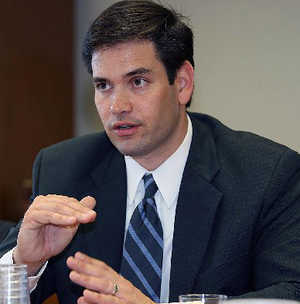 Earlier this month in an interview with Geraldo Rivera, Rubio teetered between his opposition to the current DREAM Act, which would provide citizenship, and trying to lay out a plan that would appeal to Latinos. “You can legalize someone’s status in this country with a significant amount of certainty about their future without placing them on a path toward citizenship,” he argued. But his plan would force potentially millions of undocumented students to become non-voting residents of their home country if they were only given legal status in the U.S. After the extremely anti-immigrant views that the Republican presidential candidates have staked out during the primaries, a plan to create a system of second-class citizenship is not likely to be what Latino voters are looking for from the Republican party. 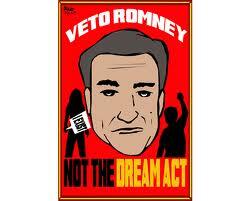 WHY IS MITT ROMNEY AGAINST THE DREAM ACT? WHAT IS THE DREAM ACT? 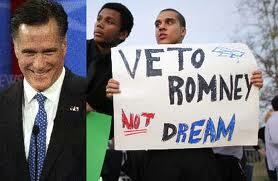 Governor Mitt Romney, You recently stated that if elected president of the United States, you would veto the federal DREAM Act and would not support any legislation that grants in-state tuition for undocumented students. At this point, we are wondering whether you know the facts about the DREAM Act as your statement appears highly inconsistent considering your political record. Vitriolic, anti-immigrant rhetoric has been the platform for some of the current presidential Republican candidates. However, we want you to set the record straight on the DREAM Act. You have to recognize the positive impact this legislation would have on the U.S. and the lives of the 2.1 million undocumented young immigrants who would benefit from it. A 2010 study by the UCLA North American Integration and Development Center estimates that the total earnings of DREAM Act beneficiaries over the course of their working lives would be between $1.4 trillion and $3.6 trillion. This translates into greater tax revenue and scores of new jobs. If you are serious about fixing the economy, the DREAM Act is the solution, not the problem. On Saturday, you said you support creating a path to legalization for undocumented immigrants who serve in the military. In fact, this is included in the DREAM Act. You also said that if elected president, you would veto the federal DREAM Act and that you don’t support giving benefits to young immigrants, such as in-state tuition. Once again, the current DREAM Act does not give undocumented youth in-state tuition or preferences over U.S. citizens. Instead, it would allow each state to decide whether or not to grant undocumented students in-state tuition and would only allow them to apply for student loans and federal work-study programs. Moreover, your recent stance on opposing a pathway to citizenship is contrary to the wishes of the American people. A recent Fox News national poll showed that 66 percent of Americans think there should be a path to citizenship for undocumented immigrants, but only if individuals meet requirements such as paying back taxes and learning English. Indeed, your current stance will not give you the support from our immigrant community and Latino voters, who will be a determining factor in the 2012 presidential race. According to a Pew Hispanic Center poll released in December, 88 percent of Latino registered voters nationwide support the DREAM Act.